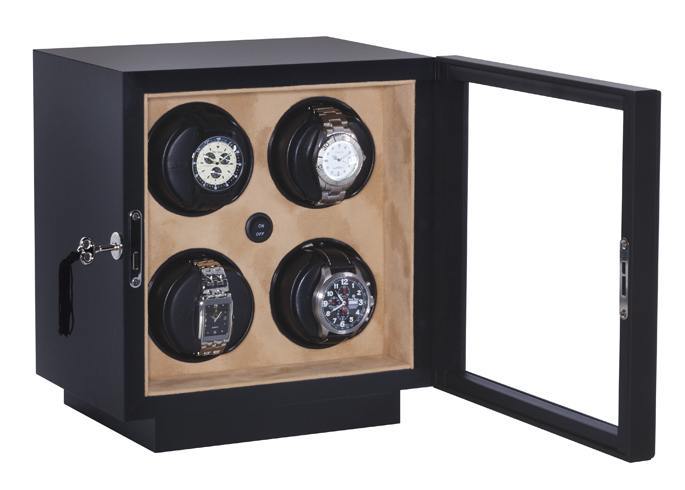 As the name implies, the Orbita INSAFE winder was primarily designed for the watch collector who keeps his or her valuable watches safely stored in a safe or vault. These units are totally portable and wireless, operating for years and years with the 8 supplied Lithium "C" cell batteries. Clearly, with battery life measured in terms of years, not months, there is no need for providing AC power. In addition to a master switch each winding head is individually powered with its own on/off switch, and operating mode switch. The rugged wooden case is covered with durable black vinyl material. 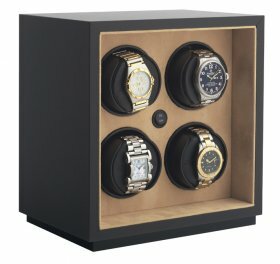 These winders are normally free-standing but also can be easily built into walls or in closets (as shown below). The pedestal base is removable. They can be ordered with either open-front construction or with a lockable black anodized aluminium door glazed with a break-resistant polycarbonate viewing panel. The door is hinged to fold down 90°to provide a convenient work surface. Doors may also be hinged left or right, to suite available space.